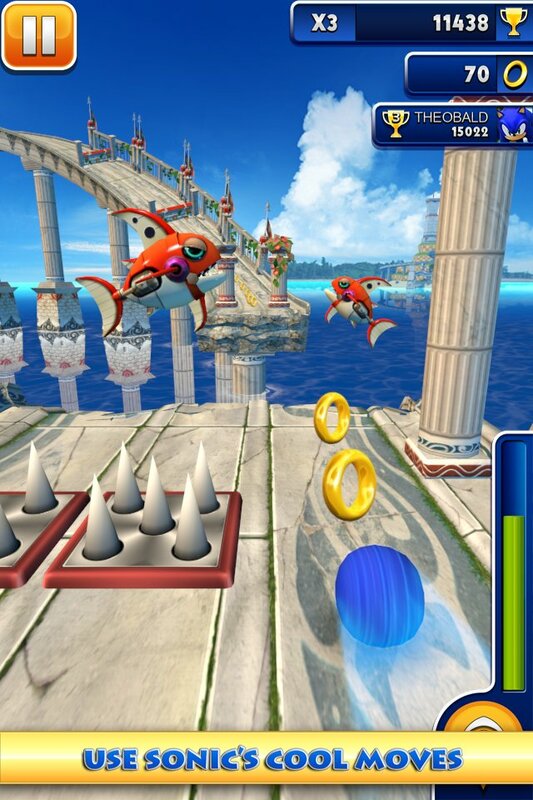 Sonic Dash : Gorgeous and Greedy? Does SEGA Ask For Too Much? I just purchased a copy of the game (v1.0.1) for a friend with a 4th Gen iPod Touch and the game is completely unplayable due to a huge amount of lag. Then I realized after doing a bit of research it would be in the vein of the modern Sonic games where you are following behind Sonic as he runs along an inexplicably treacherous landscape. This got me to thinking… Who would leave these pits, springs and spikes all over the place? Even if you are an evil scientist trying to conquer the world, that cannot be OSHA compliant for your employees. All it would take is one Crabmeat to bounce off a red spring, jam his head into one of those unnecessary giant loops and fall into an endless pit, and Robotnik would have to sell his Death Egg just to settle out-of-court. Then there’s the class-action lawsuit that would bring up the denizens of Marble Zone who have been trapped under lava for decades due to shifting blocks, or those poor souls that have had to endure the pollution of Chemical Plant Zone…Robotnik & co. would be ruined within hours. I can see it now…Mecha-Sonic sold for scrap…truly heartbreaking. I digress. This game is about running at a pretty fast pace. It may not be powered by SEGA’s much-touted “Blast Processing” in the 80’s but the iOS handles the speed of the game without losing a beat. The first thing I noticed was how unbelievably vibrant the colors are on the iPhone 5’s screen. 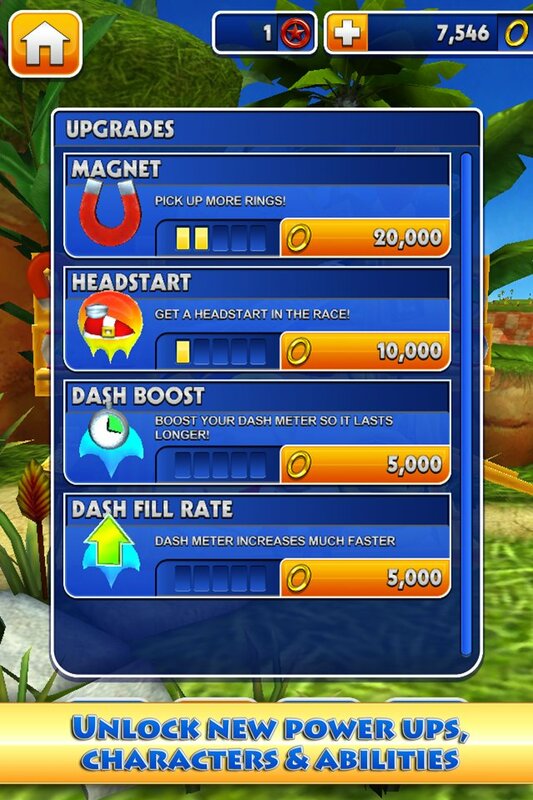 Sonic Dash uses the entire screen and it really makes this game a great tool to show off how ridiculously detailed the display can be when used properly. The colors are all distinct and not muddy, even when the terrain rushes by at a fast pace. While normally I don’t give as much thought to a game’s graphics, in these kinds of games where one visual mistake can cost you your best run, crisp, clean colors are essential to a great gameplay experience. The game appears to be yet another Temple Run knock-off at first glance, but thankfully there is no tilting required. The controls are familiar and simple. Swipe left or right to change between the three available lanes, up to jump and down to roll. Unlike many behind-the-back endless runners, you can change lanes in mid-air and do a quick spin dash while descending, allowing for interesting aerial tricks that can save you from a grisly death. Unlike Temple Run and others, you don’t actually have sudden turns to deal with, just enemies, spikes, pits, pillars, and the usual Sonic hazards. 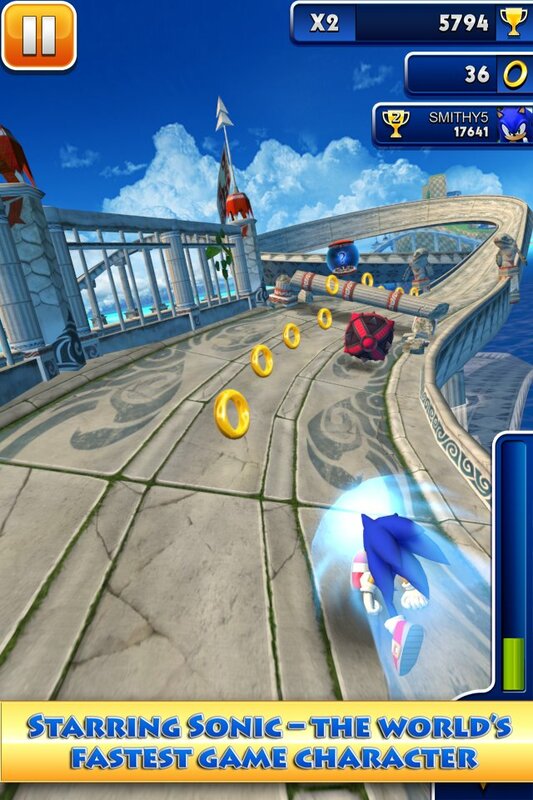 This makes Sonic Dash a bit more fluid and less jarring when the speed increases. Now, on to rings…are there golden rings? Of course there are golden rings, since I am almost positive that Sonic wouldn’t even get out of bed without his daily fix of golden rings. (he won’t settle for brass or silver from what I have been told.) These are used in two ways: first, as long as you have 1 or more rings you will not die if you hit an enemy or spike. (much like every other Sonic game, so huzzah for consistency) second, for the now-requisite endless runner upgrades. When you end a run, you bank all the rings you had picked up through the run, provided you didn’t stupidly miss jumping over a bunch of spikes which makes you lose all your rings, followed by hitting a wall at 88 miles per hour, which makes you go splat. The unlocks are pretty standard. Extended power ups, head starts, extended ring magnets and so on. Of course, here is where things get uncomfortable. Rings come at a fairly decent pace, but the game occasionally taunts you by giving you a couple of red star from time to time. 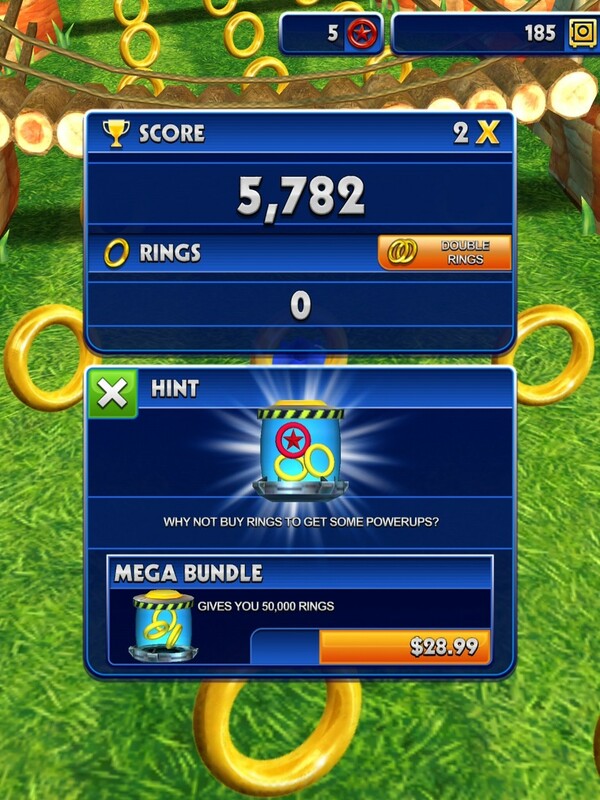 These red stars are used to unlock the additional playable characters: Tails (45 stars), Knuckles (60 stars), and Amy (30 stars) as well as buy Revive Tokens and the “Super Head Start.” Red stars are mainly acquired within the in-app store, and range from 30 for $3.99 to 300 for $28.99. Dear SEGA, 2 of these things are not hints, they are ads. For the first dozen or so games, I didn’t really mind, I just tapped the X to cancel the little window, but then started becoming annoyed. I just wanted to play the game again. Having to close multiple windows to start an endless runner becomes quite irritating when you are trying to beat a friend’s high score. Here is the thing, I expect that kind of behavior from a freemium game to an extent, but not from a game that is (at time of writing) $1.99 to even give a shot. I don’t mind IAPs, in fact I am all for them, since in reality the amount of games that need to be moved to make up for developmental costs for most high-quality games is higher than most people realize. The problem comes when I am constantly being asked to give them money. I know SEGA wants my money, I just don’t need to be reminded every game. The problem is right now IAPs are the most polarizing thing on the App store. Most people are in one of two camps: either they hate IAPs and feel they are the bane of the App store ecosystem or they tolerate them grudgingly. Very few people are happy to have them around, since as we see in this game, as well as others like My Little Pony, they can be abused. I want to play with Tails or Knuckles but don’t really want to spend $5 a character or more to have the privilege. The game doesn’t even tell me why I should buy them other than “You can play as Tails!” Great! But what is different? Does it enhance my gameplay, or does it just act like a new skin over Sonic? Without that information readily available in the app, it is hard to believe many people will be forking over cash anytime soon. I will say it is one of my favorite 3D-styled behind-the-back endless runners, so “The End” recently came off my devices to make room for this one. Maybe there is a good reason for the expensive In-App Purchases. Maybe Robotnik just needs better insurance coverage for his employees, and that’s where all the money goes. I would just consider less death traps in my kingdom, but hey, that’s just me.